An open-length victory over sealed, sloppy going in the Grade 3 Robert B. Lewis Stakes Feb. 2 was enough to earn Mucho Gusto a place in the top 10 in this week’s National Thoroughbred Racing Association (NTRA) Top 3-Year-Old Poll. Owned by Michael Lund Petersen, Mucho Gusto became the latest sophomore from the barn of Hall of Fame trainer Bob Baffert to stamp himself within the division. In his first start since finishing second to stablemate Improbable in the Grade 1 Los Alamitos CashCall Futurity on Dec. 8, Mucho Gusto won by 4 ¾ lengths in the Robert B. Lewis at Santa Anita Park to land at No. 4 on the Top 3-Year-Old Poll with 220 points. Baffert trainees make up three of the top four spots on the Top 3-Year-Old Poll. Eclipse Award winner Game Winner remains in first with 37 first-place votes and 405 points. Improbable is second (three first-place votes, 350 points) with War of Will, trained by Mark Casse, sitting third (one first-place vote, 273 points). Instagrand (163 points), Knicks Go (135), Hidden Scroll (118), Signalman (102), Gunmetal Gray (88) and Tax (66) round out the top 10. Tax, winner of Grade 3 Withers Stakes this past Saturday, joins Mucho Gusto in being a new addition to the top 10. 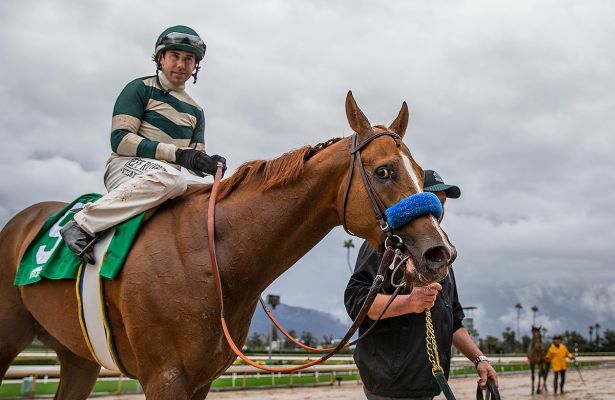 A gritty effort from Battle of Midway in the Grade 2 San Pasqual Stakes at Santa Anita on Saturday allowed the son of Smart Strike to make an appearance in the NTRA Top Thoroughbred Poll. With jockey Flavien Prat in the irons, Battle of Midway prevailed by half a length over McKinzie to earn the fourth position among poll voters with 224 points, including one first-place vote. Recently retired City of Light, winner of the $9 million Pegasus World Cup Invitational, remained in the top poll position with 36 first-place votes and 369 points with champions Monomoy Girl (five first-place votes, 295 points) and Roy H (267 points) second and third, respectively. Rounding out the top 10 are: Bricks and Mortar in fifth (220 points), Accelerate (208), McKinzie (154), Seeking the Soul (141), Sistercharlie (86), and Game Winner (76). The NTRA Top Thoroughbred Poll concludes No. 4 after the running of the Breeders’ Cup.